Numerous vendors have presented their products to my interior design team at Weber Thompson. Every time a bath fixture vendor has promoted a shower pan I’ve eagerly asked if we can customize their pan, and every time I’ve prepared myself for the usual negative answer. However, one lucky day a few years ago I finally heard the response I wanted. With no hesitation, a local representative for MTI Baths took me up on the offer, and the process of customization began. While it is common for us designers to customize a piece of furniture to suit the aesthetic needs of a project, never have we customized a shower pan, or any bath fixture for that matter. Vendors don’t usually get the request; they simply offer various product lines in a couple of standard sizes. However, as designers of multifamily housing, we must comply with accessibility standards, which are now more thoroughly enforced than ever before. Weber Thompson has always been a leader in offering universal design solutions and I personally am passionate about ensuring our projects integrate these principles as seamlessly as possible. However, the typical shower pan presents many problems for the multifamily audience, which is why I was so eager to work with MTI Baths to find a better solution. Last spring, MTI baths flew myself and a fellow designer to their headquarters in Sugar Hill, Georgia so I could work directly with their designers and technical experts to develop this new concept. This new shower pan, referred to as “The Rachael Shower Pan”, for lack of a better name, was developed to meet the accumulative views of our accessibility consultants to comply as a Type B unit transfer shower according to both the ANSI ICC A117.1-2009 (Accessible and Usable Buildings and Facilities) as well as the FHA (Fair Housing Act). Typically, a 36” minimum clear area is required within shower pans, but many consultants have differing views as to where this is measured from. The standard shower pan is 36” deep, framing to framing, which falls short of the requirement. This new pan is actually 40” deep and provides plenty of clearance when measured at the most conservative spot: the floor curb. While the requirement for the length of the pan is also 36” minimum clear, most developers want a shower that is grander. A typical shower pan length might be 48” framing to framing, but this pan is 50” framing to framing, which, after adding the thickness of the tile assembly on both sides, allows for the required 30” x 48” parallel approach outside of the shower starting at the control side of the wall and does not interfere with the opposite wall. The most conservative view presented to us regarding curb height is ½” maximum in height. However, many developers of multifamily buildings want a more substantial curb to prevent water leakage into the bathroom. I came up with a concept for a removable curb/threshold. The curb is caulked in place & adhered with waterproof tape backing after tile is installed. This solution also works for those aging in place, as it can be removed later for wheelchair access if needed. Most other shower pans require recessing into the slab due to the height of the fixed curb, which is costly. This shower does not need to be recessed into the slab, which is ideal in a multifamily project with hundreds of shower pans. 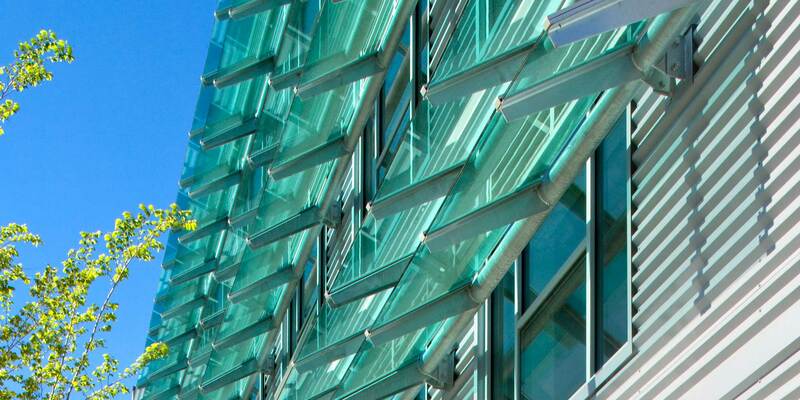 Its slim profile complies with the ½” maximum height (without curb) as outlined above. While the pan meets accessibility requirements, it’s also attractive and cost effective. I worked with MTI baths to include a clean-looking square shower drain as opposed to a standard round one with obvious screw plates. Additionally, the flange of this shower pan (which is concealed after installation), is held back to allow for a completely flush alcove installation. Other typical models require the wall to extend past the face of the shower pan. Not only does this look mediocre, it also results in a few inches of lost space in the bathroom. While the follow-up coordination after the trip was challenging at times due to physical distance (WT is located in Seattle, MTI baths is in Georgia) the team at MTI baths was very responsive in providing cutsheets and installation instructions. One day our receptionist called my desk to inform me a very large package had arrived. A full size shower pan was shipped to Seattle so I could see it in person so my team and I could work out any kinks. This also allowed our clients to see the pan for themselves so they’d be reassured of the functionality of the pan (especially with this new removable curb concept) and its uncompromised aesthetics. 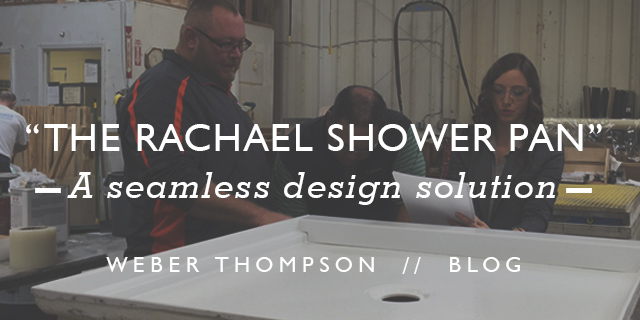 While conceptual designs are great, seeing “The Rachael Shower Pan” installed in one of our projects has been the ultimate reward. Helios, at 2nd & Pine in Seattle, features this new accessible shower pan, which fits beautifully with the modern aesthetic of the project. We hope to specify it in future projects so we can continue creating beautiful, accessible homes for people of all abilities. We also hope to inspire other designers to take the initiative and push for better, more accessible products in the multifamily industry. The sky’s the limit! Rachael Bauer is a Senior Associate and team member of the Weber Thompson Interior Design studio. She works on a variety of projects including commercial office and multifamily residential, and is passionate about how design can influence behaviors and quality of life. Learn more about her on our website or in this recent Meet the Staff post.